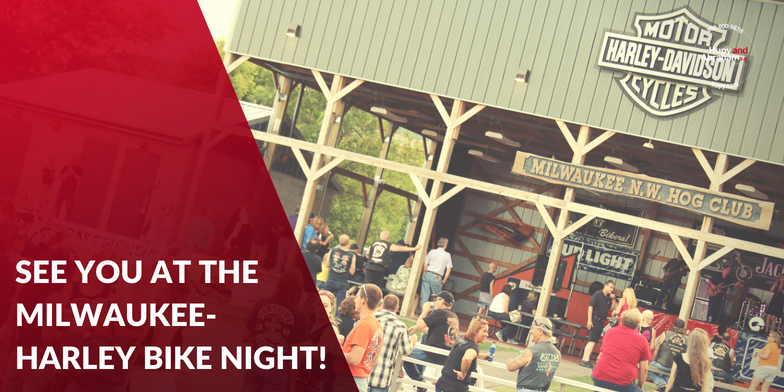 Join Us: Milwaukee Harley-Davidson Bike Night! | Hupy and Abraham, S.C.
Join Us: Milwaukee Harley-Davidson Bike Night! Join us TONIGHT for the very first “Two Wheel Tuesday” bike night of the year for Milwaukee Harley-Davidson! For years, Hupy and Abraham, S.C. has been a proud partner and supporter of Milwaukee Harley-Davidson. Join them now as the dealership launches another exciting year with a whole new grass-roots vision! Getting back to their riding and racing roots, attractions for the dealership this year include group rides for beginners and experts alike to great local events like the Harley-Davidson Museum Bike Nights. Once again this year, Milwaukee Harley-Davidson is also hosting one of the greatest parties around during the Milwaukee Rally and the Harley-Davidson 115th Anniversary! Join this hometown dealership for incredible tunes, great vendors, food and so much more. Those are not the only exciting changes for Milwaukee-Harley Davidson this year. The dealership, part of the Windy City Motorcycle Company (a collaboration of 16 dealerships across Wisconsin and Illinois) will now be gaining a sister site in the form of West Bend Harley-Davidson in West Bend, Wisconsin. West Bend Harley-Davidson was recently acquired by Milwaukee Motorcycle Co., an affiliate of Windy City Motorcycle Company. We are so excited to see the amazing growth and changes for Milwaukee Harley-Davidson and West Bend Harley-Davidson this year! Be sure to join us and stop by the Hupy and Abraham booth this summer during bike night and the Milwaukee Rally to get your FREE “Watch for Motorcycles” bumper sticker and hat!